You probably think you know what header bidding is, but how deep is your understanding? Nowadays, most of us have a handle on the difference between header bidding and waterfalling, but what about client-side header bidding, server-side header bidding and server-to-server integrations? Take a look at our handy chart and visual aids to test your understanding of what’s become quite a complicated subject. 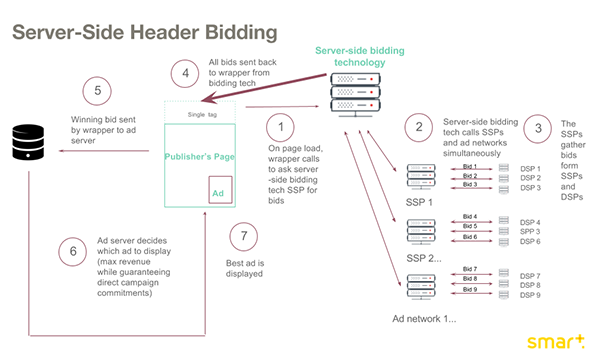 What is client-side header bidding? 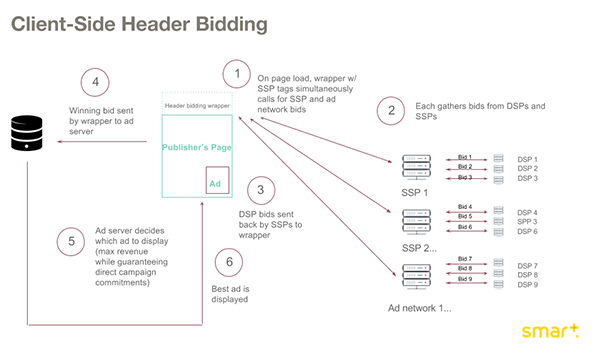 Client-side header bidding is a real time SSP competition, that maximizes the number of demand partners bidding simultaneously on a publisher’s inventory. The process requires a wrapper that goes into a web page’s header and the publisher gets to select how many demand sources to plug into the wrapper. In server-side header bidding, the publisher chooses a server-side bidding technology partner to implement and host the solution. A single call is made from the web page to the third-party server, which then continues making calls server side to all integrated demand sources. The wrapper sends all bids and prices back to the publisher, so pricing is extremely transparent. This is especially great for mobile, where a high bandwidth is necessary to sustain the connection and ensure the ads are properly delivered. What are server-to-server SSP integrations? 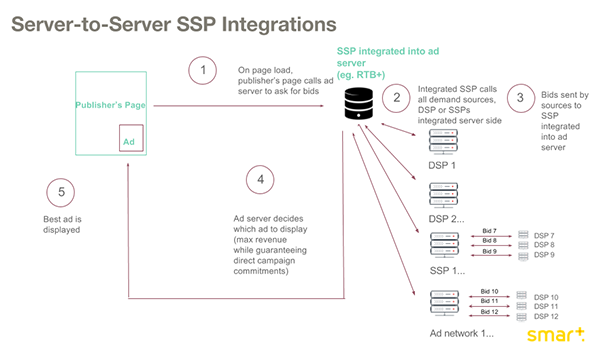 SSPs are integrated server side within the primary SSP, just like a DSP, resulting in a complete competition between all demand partners. Now that you have the definitions of each, it’s time to take a deep dive into how waterfalling, client-side header bidding, server-side header bidding and server-to-server integrations match up to one another. 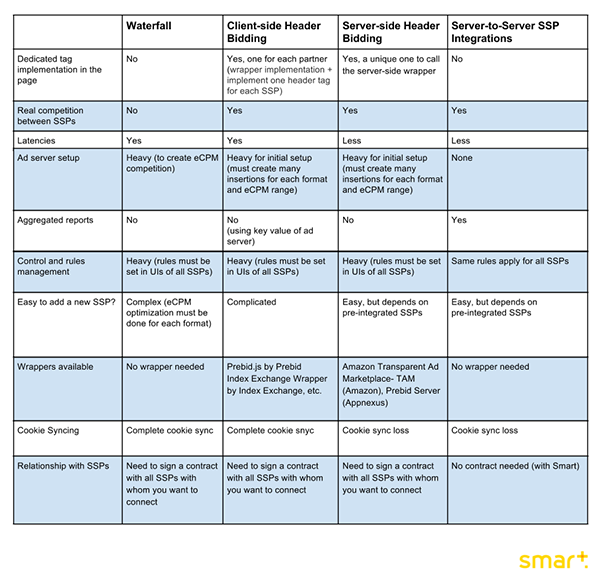 This chart explains how each handles latencies, competition between SSPs, ad server set up, control and rules management, cookie syncing and more.